ASIGN allows the receiver of audio-visual content to interact with the original data at the sender side, and focus network resources on sending primarily operationally relevant content. ASIGN can reduce bandwidth needs by 99%, reduce content access costs and delay, or increase number of cameras correspondingly, without sacrificing relevant precision. 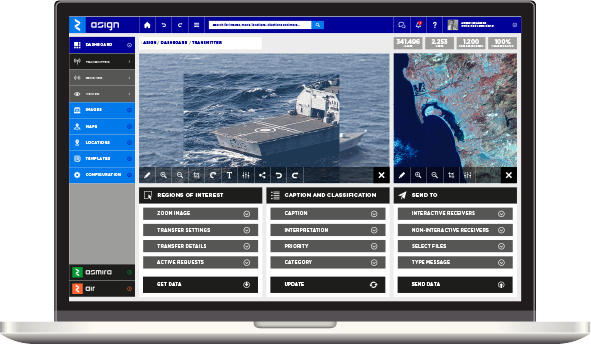 Developed to work anywhere, anytime, for mobile satellite networks, ASIGN can operate with any unknown, variable, even unreliable, bandwidth-limited network, and supports geo- and time-tagged photos and video communication with integration into maps. ASIGN is a Certified Application for Inmarsat satellite communication, verified to excel over TETRA/TEDS and works over GPRS/EDGE/3G/4G cellular systems; and in general any type of network. Offline modes of operations are also supported. ASIGN Field Communicator – Interactive Sender, allowing field users to send (push) photos and video clips, geo-tag them, tethered shooting, while remote analysts via previews can access the original images in real time, or later, and request (pull) regions of interest in up to full resolution. Kestrel weather stations can be used to meta-tag images with whether data. ASIGN Field Communicator – Interactive Receiver, allowing a central location to push previews out to the field, where users can pull regions of interest. This is basically the reverse operation of using ASIGN from the field. GEO-ASIGN (beta) is a special version, similar to the Interactive Receiver, that in this case is used for Satellite Earth Observation images. This allows updated high precision content to be quickly available over very slow networks (demonstrated over 2 kbps in the field). ASIGN Pro can be used to connect external cameras and allows tethered shooting (for some Android models), and connection to GoPro and other Wireless SD cards (FlashAir), as well as using the built in camera for interactively communicating photo content. Text and assessment templates are supported. All objects are geo-tagged. 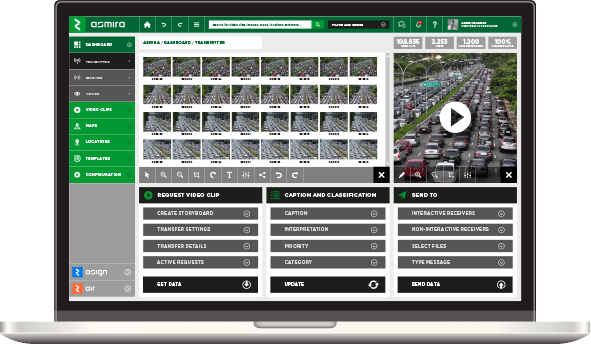 ASIGN Pro is developed for police operations and crisis management specifically. Online questionnaire forms for needs assessment are supported. ASIGN Pro can be configured to communicate with any server, as long as users have username and password. Security is provided via encrypted image containers. ASIGN Crowd is a light version that comes preconfigured for reliable crowdsourcing using consistently formatted data for rapid and precise analysis. UN-ASIGN is a crowdsourcing application developed and released for the United Nations. Data are sent to an ASIGN server at CERN in Geneva, Switzerland. The UN assess the data and creates rapid mapping, esri GIS and reports that provide the national emergency stakeholders with invaluable situational awareness. ASIGN Central Commander is the hub of all information from and to ASIGN field users and for integrating into other systems, setting up GIS feeds and sharing data with non-ASIGN users as well. The ASIGN server has a Web interface and allows data to be accessed and analyzed via commonly used web browsers. While the general model is to have users work on a cloud-hosted server, private servers can also be provided to users who demand total control over where the data is residing. ASMIRA Adaptive Video Streaming allows video encoders to adapt the rate of coding to unknown network capacity, using feedback from the receiver. Users also can set specific priorities and rates if desired. From the receiver side, the video can be cropped to a region of interest, and all the capacity can be focused there. The selection can quickly be reverted to full view video. The stream can be protected against transmission errors using Network Coding. The Sender can geo-tag the stream. ASMIRA receivers can command the Sender to cut video streams into video clips, and generate still images from the original source. Additional ASMIRA Viewers can be connected to Receivers to share content with multiple destinations. ASMIRA runs on PC and embedded Linux. 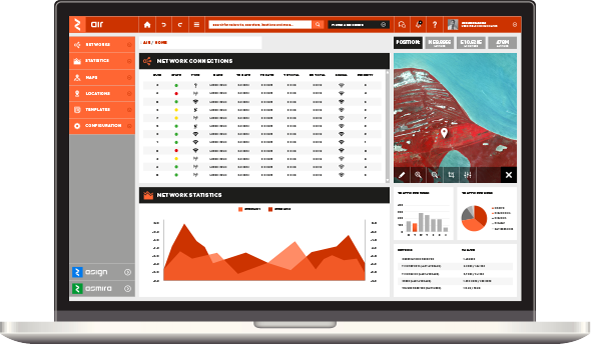 AIR Smart Networking allows Senders to be connected to several types of networks simultaneously. Selection of what networks to use, one or several, can be based on a table, an algorithm or controlled manually from sender or receiver. Traffic shaping and firewalling can be done per network dynamically, allowing cost and utilization control and management. AIR can also be used as a network emulator, to test performance with a certain delay or packet error rate. AIR works well with ASIGN and ASMIRA, but allows third party applications to also be used. 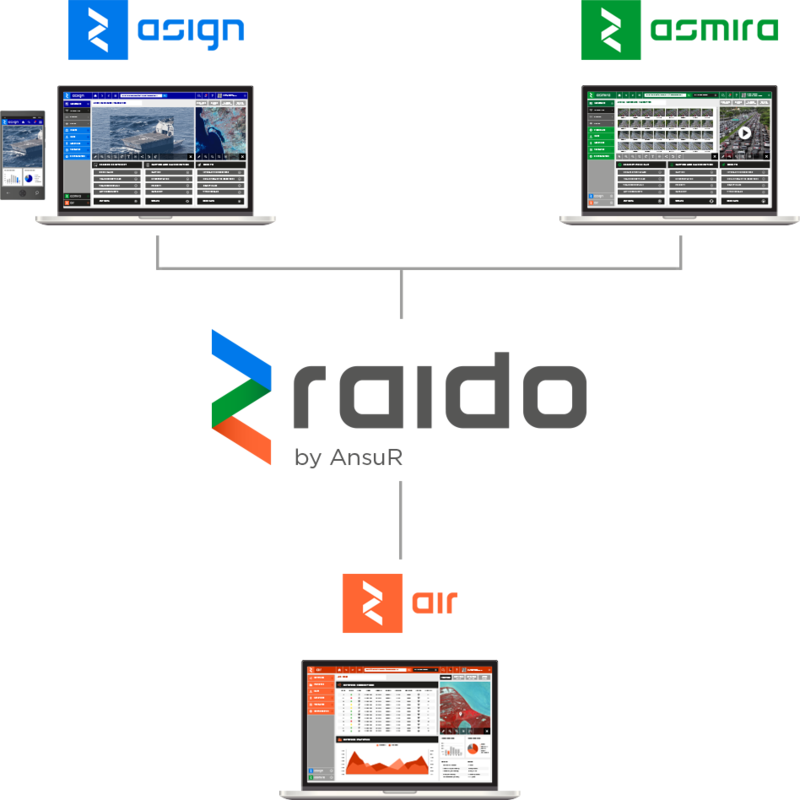 AIR allows users to control and limit type and traffic volume and corresponding cost on mobile satellite networks. It runs on Linux platforms.